I am quite sure that many of us have heard of the Olympics before, and most of us would have had watched the opening and closing ceremonies on via a TV broadcast before, while a smaller number among us are blessed enough to be able to attend the opening and closing ceremonies in person. As for the Winter Olympics, that is a lesser known event with a smaller number of following for obvious reasons – not all countries experience winter. 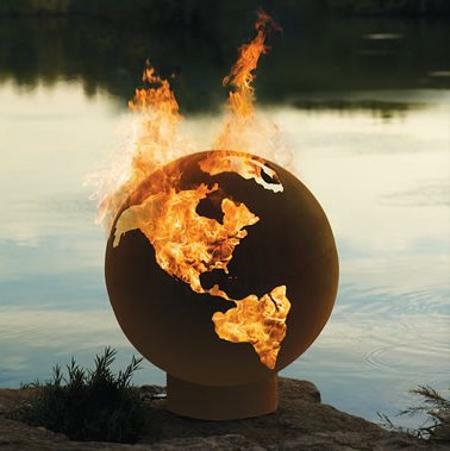 Well, for those who still have fond memories of the fire pit which was on show at the Athletes’ Village during the 2010 Vancouver Winter Olympics will be pleased to hear that a hand-crafted replica in the form of the $1,700 Athletes’ Village Fire Pit Globe is now available. Sporting a unique globe-shaped design, it comes with cutouts in the shapes of the different continents, where it will evoke the international spirit of the Games while doubling up as a warm gathering place whenever your family and friends meet. The Athletes’ Village Fire Pit Globe has been individually crafted by Rick Wittrig, who happens to be a functional steel artist who picked up welding and blacksmithing techniques as he grew up in a Mennonite community. The fire pit itself has been forged from the pits of Mount Doom – nay, I’m kidding, but rather, from heavy-gauge 1/4″-thick carbon steel.